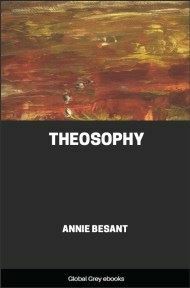 A book about all aspects of Theosophy; Theosophy As Science; Theosophy As Morality And Art; Theosophy As Philosophy; Theosophy As Religion; Theosophy Applied To Social Problems; A Few Details About Systems And Worlds; and, The Theosophical Society. The old ways of study was to state universals, and to descend from them to particulars, and it remains the best way for serious and philosophic students. The modern way is to begin with particulars, and to ascend from them to universals; for the modern reader, who has not yet made up his mind to a serious study of a subject, this is the easier road, for it keeps the most difficult part for the last. As this little book is meant for the general reader, I follow this way. Theosophy accepts the – method — of Science – observation, experiment, arrangement of ascertained facts, induction, hypothesis, deduction, verification, assertion of the discovered truth but immensely increases its area. It sees the sum of existence as containing but two factors, Life and Form, or, as some call them, Spirit and Matter, others Time and Space, for Spirit is God’s motion, while Matter is His stillness; both find their union in Him. Since the Root of Spirit is His Life, and the Root of Matter is the universal ether, the two aspects of the One Eternal, out of Space and Time. [See section III]. While ordinary science confines Matter to the tangible, Theosophical science extends it through many grades, intangible to the physical, but tangible to the superphysical senses. It has observed that the condition of knowing the physical universe is the possession of a physical body, of which certain parts have been evolved into organs of sense, eyes, ears, etc., thought which perception of outside objects is possible, and other parts have been evolved into organs of action, hands, feet, and the rest, through which contact with outside objects can be obtained. 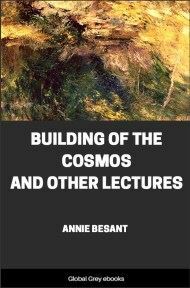 It sees that, in the past, physical evolution has been brought about by the efforts of life to use its nascent powers, and that the struggle to exercise an inborn faculty has slowly shaped matter into an organ through which that faculty can be more fully exercised. To reverse Büchner’s statement: We do not walk because we have legs; we have legs because we wanted to move. We can trace the growth of legs from the temporary pseudopodia of the amœba, through the development of permanent protrusions from bodies, up to the legs of man, and they were all gradually formed by the efforts of the living creature to move. As W.K. Clifford said of the huge saurians of a past age: ‘Some wanted to fly, and they became birds”. The “Will to live” –that is, to desire , to think, to act –lies behind all evolution. 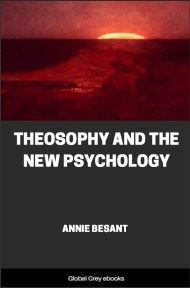 The Theosophist carries on the same principle into higher realms, if such exist; and if consciousness is to know any other sphere [ I use the word “sphere” to indicate the whole extent of matter belonging to a definite type, i.e.., built of atoms of one sort. See under “Atoms” in Section VI. There may be several worlds in a sphere; thus the heaven-world is in the mental sphere. The word plane has been used in this sense, but it is found that people do not readily grasp its meaning.] than the physical, it must have a body of matter belonging to the sphere it wants to investigate, and the body must have senses, developed by the same want of the Life to see, to hear, etc. That there should be other spheres, and other bodies through which those spheres can be known, is no more inherently incredible than that there is a physical sphere, and that there are physical bodies through which we know it. 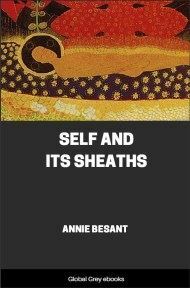 The Occultist –the student of the workings of the divine Mind in Nature –asserts that there are such spheres, and that he has and uses such bodies. 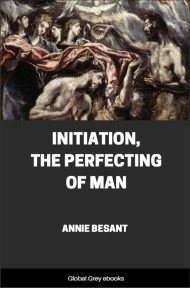 The following statements – with one exception which will be noted in its place – are made as results of investigations carried on in such spheres by the use of such bodies by the writer and other Occultists; we all received the outline from highly developed members of our humanity, and have proved it true, step by step, and have filled in many gaps, by our own researches. We , therefore, feel that we have a right to affirm, on our own firsthand experience –stretching over a period of twenty-three years in one case, and twenty five in another –that superphysical research is practicable, and is as trustworthy as physical research, and should be carried on in similar ways; that investigators are subject to errors, both in physical and superphysical spheres, and for similar reasons, and that these errors should lead to closer research and not to its discontinuance. The following table presents a view of the spheres related to and including our earth, of the bodies used in investigating them, and of the states of consciousness manifested through them by their owner, the Man. The Eternal Man, a fragment of the Life of God, is called the Monad, a “oneness”; [ This is the statement, including what is said farther on about the Monad, noted above, as not having been verified by the writer’s own observation. This highest Self is only made manifest to such as we are on rare occasions in a great down flow of dazzling light: in his own nature, in his own world, he is beyond the reach of any vision yet attained by any of us. Yet what we call our life is his, since he is the highest Self in each of us, “the hidden God” –as the Egyptians used to say.] he is verily a Son of God, made in His image, and expressing his life in three ways: by the aspect of Will, the aspect of Wisdom, the aspect of Creative Activity. He lives in his own sphere, a spark in the divine Fire, and sends down a ray, a current of his life, which embodies itself in the five spheres of manifestation. This ray, appropriating an atom of matter from each of the three higher of these spheres, appears as the human Spirit, reproducing the three aspects of the Monad, of will, Wisdom, and Creative Activity, and reveals himself, at a certain stage of evolution, as the human ego, the individualised Self ; he begins his long journey as a mere seed of life, and, never losing his identity, moves through that long journey, unfolding all the powers of the Monad, that lie hidden within him, as the tree within the seed. As he conquers his kingdom of matter, his Parent-Monad pours down into him more and more life, and draws from him more and more knowledge of the worlds in which he lives. But the passing into the three highest manifested spheres is not enough for gaining full knowledge and full power in our Solar System; two yet remain, and the process of dipping down into matter goes on.